No, that’s not a joke; the family’s last name is Fancy. Harry and Jane Fancy were from the British Isles, and came to the Toronto area in a time when fish and chip stands were on every street corner like the pizza, subs, and pita places we have now. Surely, in over 50 years of serving seafood fares, they have to have something that works. I very much enjoyed my English pub style battered fish at Fancy’s. The atmosphere is a little dated, the carpets have seen better days, and the wooden tables could be refinished, but the seafarer theme is entirely appropriate for the restaurant and quite charming. Actually, the restaurant at this Bell Farm Road and St. Vincent location has been open since the early 1980s. Much of its interior is its original design, which its owners don’t want to mess with too much at this point. The restaurant is huge, and is decorated with fish, lobster traps and boat steering wheels. According to Amanda, our server, “there is a story behind every fish on the wall.” I personally liked the giant swordfish on the wall. We didn’t come in with enough people but there actually is a table for 12 shaped like an enormous fish. At one time, all of these clever decorative flairs were brand new, had no dings and dents, and today they go a little unnoticed and under-appreciated. What people who frequent Fancy’s come in for is the price, the quality, and the authentic family atmosphere. They had 4 battered fish dishes ranging between $10.50 for the tilapia and $14.50 for the halibut. There were also a number of awesome seafood appetizers like crab cakes, seafood stuffed potato skins and escargot all for under $7.00. 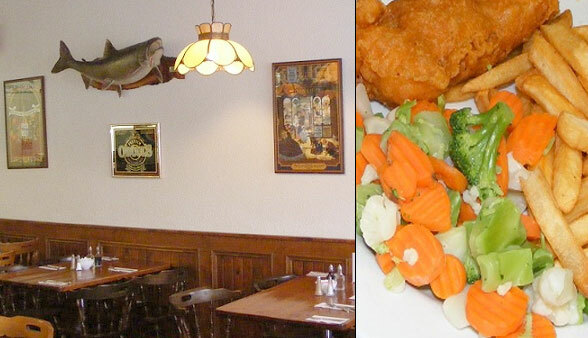 The restaurant also serves up some nice pan fried Halibut, salmon, or rainbow trout steaks. I’m a bit nuts for battered fish. I come from an English family, and in England, the battered fish is a bit like the holy grail of meals. I’d say, according to my standards, nobody would go home unhappy having the fish meals we had at Fancy’s. I can’t say the same for many of the big-box-chain restaurants that have one or two fish dinners on the menu. It’s so easy to burn the batter, and under-cook the meat, that I’ve always had my best fish dinner experiences at the local restaurants like Fancy’s. It’s really ironic that this place isn’t very Fancy, but what it is, is authentic. You can have a good family experience, or stay after dinner for beers with the buddies. The restaurant has a full take-out menu, so you can call-in and pick up your order and bring it home, or to the office. The restaurant also offers a very well designed webpage that includes the entire menu and I’m guessing most vegetarians would be cool with the menu too. Gone are the times where fish and chips are on every street corner, but this restaurant is a little homage to that feeling, and that’s what keeps bringing me back.